修迪, 陈超, 专少鹏, 申宗义, 王金贵, 程洲, 张立国, 王硕, 杨鑫朋, 侯德华, 石光耀, 张鹏程. 北山石板井地区英云闪长岩-石英闪长岩体锆石U-Pb年龄、成因及对古洋盆俯冲作用时限的制约[J]. 地质通报, 2018, 37(6): 975-986. 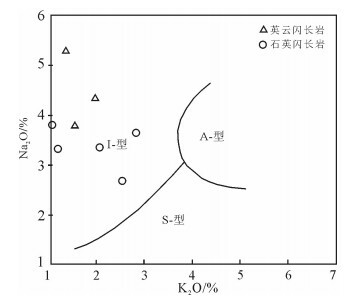 Xiu D, Chen C, Zhuan S P, Shen Z Y, Wang J G, Cheng Z, Zhang L G, Wang S, Yang X P, Hou D H, Shi G Y, Zhang P C. Zircon U-Pb age and petrogenesis of tonalite-quartz diorite in the Shibanjing area, central Beishan orogenic belt, and its constraint on subduction of the ancient oceanic basin[J]. Geological Bulletin of China, 2018, 37(6): 975-986. Abstract: The Early Paleozoic Yingyun diorite-quartz diorite is exposed in the Shibanjing area of central Beishan orogenic belt. In this paper, LA-ICP-MS zircon U-Pb dating of the rock mass was conducted, and the 206Pb/238U average age is 464.4±2.1Ma. According to geochemical data, the rocks belong to the calc-alkaline to high potassium calc-alkaline, quasi-aluminous I type granite. In view of its petrogenesis, the authors hold that the magma source of tonalite-quartz diorite was formed by mixed magma from the crust and magma from the depleted mantle under the conditions of high pressure(>1.5GPa) and low temperature(719～792℃), with the residual minerals of garnet+ruble (without amphibole). 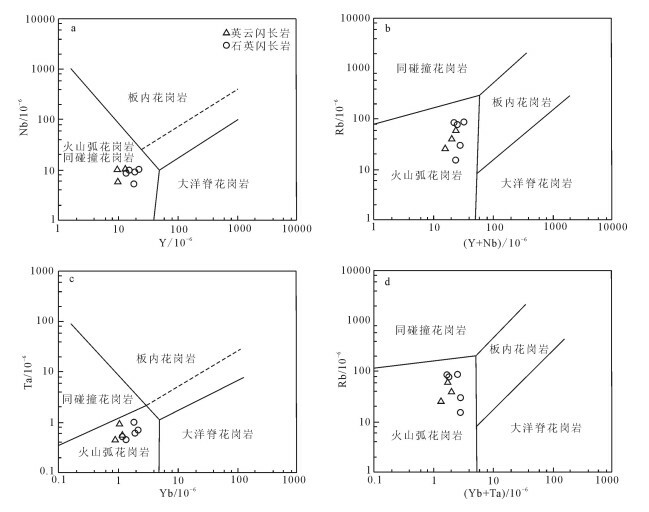 Moreover, trace element composition is characterized by enrichment of large ion lithophile ele-ments (LILEs), such as Rb, Ba, Th, U and K, and depletion of high field strength elements(HFSEs), Ta, Nb, P, and Ti, showing the geo-chemical features of the typical island arc granite. It is further proved that the rock mass was formed in an island arc environment on the discriminant map of trace elements tectonic environment. It constitutes "oceanic trench-arc" system with the south side of the Hongli-uhe-Niuquanzi-Xichangjing Paleozoic oceanic basin, indicating that the Hongliuhe-Niuquanzi-Hidangjing Paleozoic basin had sub-ducted northward in the late Middle Ordovician. The closure time of the ocean basin should be later than Middle Ordovician. 刘雪亚, 王荃. 中国西部北山造山带的大地构造及其演化[J]. 地学研究, 1995, 28(1): 37–48. Xiao W J, Mao Q G, Windley B F, et al. 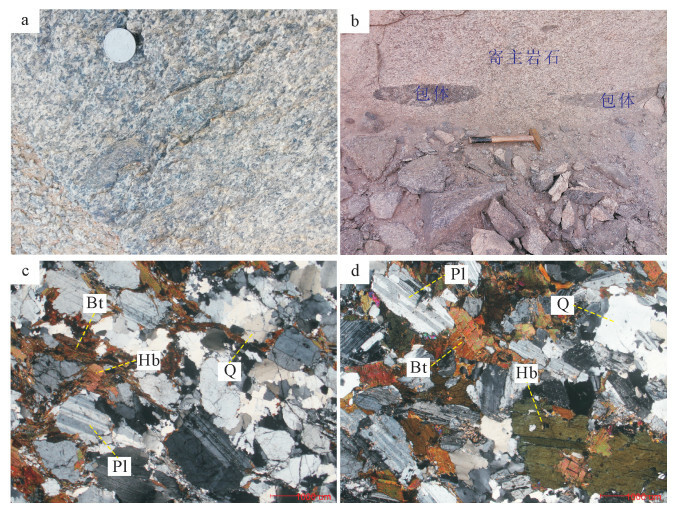 Paleozoic multiple accre-tionary and collisional processes of the Beishan orogenic collage[J]. American Journal of Science, 2010, 310(10): 1553–1594. 杨合群, 赵国斌, 李英, 等. 新疆-甘肃-内蒙古衔接区古生代构造背景与成矿的关系[J]. 地质通报, 2012, 31(2/3): 413–421. 李舢, 王涛, 童英, 等. 北山柳园地区双峰山早泥盆世A型花岗岩的确定及其构造演化意义[J]. 岩石矿物学杂志, 2009, 28(5): 407–422. 杨合群, 李英, 杨建国, 等. 北山造山带的基本成矿特征[J]. 西北地质, 2006, 39(2): 78–95. 戴霜, 方晓敏, 张翔, 等. 北山中部地区闪长岩-花岗岩类成因及构造背景[J]. 兰州大学学报(自然科学版), 2003, 39(1): 86–92. 江思宏, 聂凤军. 北山地区花岗岩类成因的Nd同位素制约[J]. 地质学报, 2006, 80(6): 826–842. 聂凤军, 胡朋, 江思宏, 等. 北山北部古生代两类花岗岩及有关矿床的钕同位素特征[J]. 矿床地质, 2006, 25: 139–142. 赵泽辉, 郭召杰, 王毅. 甘肃北山柳园地区花岗岩类的年代学、地球化学特征及构造意义[J]. 岩石学报, 2007, 23(8): 1847–1860. 毛启贵, 肖文交, 韩春明, 等. 北山柳园地区中志留世埃达克质花岗岩类及其地质意义[J]. 岩石学报, 2010, 26(2): 584–596. 郑荣国, 吴泰然, 张文, 等. 甘肃北山中带早泥盆世的构造-岩浆作用:来自公婆泉花岗岩体年代学和地球化学证据[J]. 北京大学学报(自然科学版), 2012, 48(4): 603–616. 贺振宇, 宗克清, 姜洪颖, 等. 北山造山带南部早古生代构造演化:来自花岗岩的约束[J]. 岩石学报, 2014, 30(8): 2324–2338. 赵志雄, 贾元琴, 许海, 等. 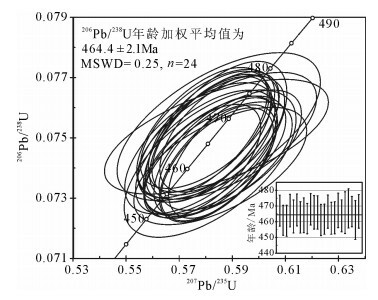 北山交叉沟石英闪长岩锆石LA-ICPMS U-Pb年龄及构造意义[J]. 地质学报, 2015, 89(7): 1210–1218. Watson E B, Harrison T M. Zircon saturation revisited Tempera-ture and composition effect in a variety of crustal magmas types[J]. Earth and Planetary Science Letters, 1983, 64: 295–304. DOI:10.1016/0012-821X(83)90211-X. Middlemost E A K. Naming materials in the magma/igneous rock system[J]. Earth Science Research, 1994, 37: 215–224. Maniar P D, Piccoli P M. Tectonic discrimination of granitoids[J]. Geological Society of American Bulletin, 1989, 101: 635–643. 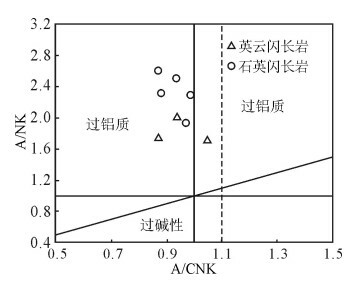 DOI:10.1130/0016-7606(1989)101<0635:TDOG>2.3.CO;2. Thompson R T. British Tertiary volcanic province[J]. Scottish Jour-nal of Geology, 1982, 18: 49–107. DOI:10.1144/sjg18010049. Sun S S, Mc Donough W F. Chemical and isotopic system atics of oceanic basalts:implications for mantle compositi on and pro-cesses[M]. London: Geological Society Special Publication, 1989: 313-345. Liu Y S, Gao S, Hu Z C, et al. Continental and oceanic crust recy-cling-induced melt-peridotite interactions in the Trans North Chi-na Orogen:U-Pb dating, Hf isotopes and trace elements in zircons from mantle xenoliths[J]. Journal of Petrology, 2009, 51: 537–571. Ludwig K R. Isoplot/EX version 2. 49. A Geochronological Tool-kit for Microsoft Excel[M]. Berkeley: Berkeley Geochronology Center Special Publication No. 1a, 2003. 1-56. 吴福元, 李献华, 杨进辉, 等. 花岗岩成因研究的若干问题[J]. 岩石学报, 2007, 23(6): 1217–1238. Chappell B W, White A J R. I-and S-type granites in the Lach-lan Fold Belt[J]. Transactions of the Royal Society of Edinburgh:Earth-Sciences, 1992, 83(1/2): 1–26. Ghani A A, Searle M, Robb L, et al. Transitional I-and S-type characteristic in the Main Range Granite, Peninsular Malaysia[J]. Journal of Asian E arth Sciences, 2013, 76: 225–240. DOI:10.1016/j.jseaes.2013.05.013. Bromiley G D, Redfern S A T. The role of TiO2 phases during melt-ing of subduction-modified crust:lmplications for deep mantle melt-ing[J]. Earth and Planetary Science Letters, 2008, 267(1/2): 301–308. Barth M G, Mc Donough W F, Rudnick R L. Tracking the bud-get of Nb and Ta in the continental crust[J]. Chemical Geology, 2000, 165(3/4): 197–213. Rudnick R L, Barth M, Horn I. Rutile-bearing refractory eclog-ites:Missing link between continents and depleted mantle[J]. Sci-ence, 2000, 287(5451): 278–281. DOI:10.1126/science.287.5451.278. Rudnick R, Gao S. Composition of the continental crust[C]//Rudnick R. The crust, treatise on geochemistry. Amsterdam: Else-vier, 2003, 3: 1-64. Mc Donough W F. Compositional model for earth' core[C]//Carlson R W. The mantle and core, treatise on Geochemistry. Am-sterdam: Elsevier, 2003, 2: 547-568. Didier J, Barbarin B. The different types of enclaves in granitesNomenclature[M]. Enclaves and Uranite Petrology. Elservier: Am-sterdam, 1991: 19-23. Defant M J, Drummond M S. Derivation of some modern arc mag-mas by melting of young subduction lithosphere[J]. Nature, 1990, 347: 662–665. DOI:10.1038/347662a0. He YS, Li SG, Hoefs J, et al. Post-collisional granitoids from the Dabie orogen:New evidence for partial melting of a thickened con-tinental crust[J]. Geochimica et Cosmochimica Acta, 2011, 75(13): 3815–3838. DOI:10.1016/j.gca.2011.04.011. 李承东, 张旗, 苗来成, 等. 冀北中生代高Sr低Y和低Sr低Y型花岗岩:地球化学、成因及其与成矿作用的关系[J]. 岩石学报, 2004, 20(2): 269–284. Xiong X L. Trace element evidence for growtli of early continental crust by melting of rutile-bearing hydrous eclogite[J]. Geology, 2006, 34(11): 945–948. DOI:10.1130/G22711A.1. Watson E B, Harrison T M. Zircon saturation revisited:Tempera-ture and composition effects in a variety of crustal magma types[J]. Earth and Planetary Science Letters, 1983, 64(2): 295–304. DOI:10.1016/0012-821X(83)90211-X. Chappell B W, Btyant C J, Wyborn D, et al. High-and low-tem-perature granites[J]. 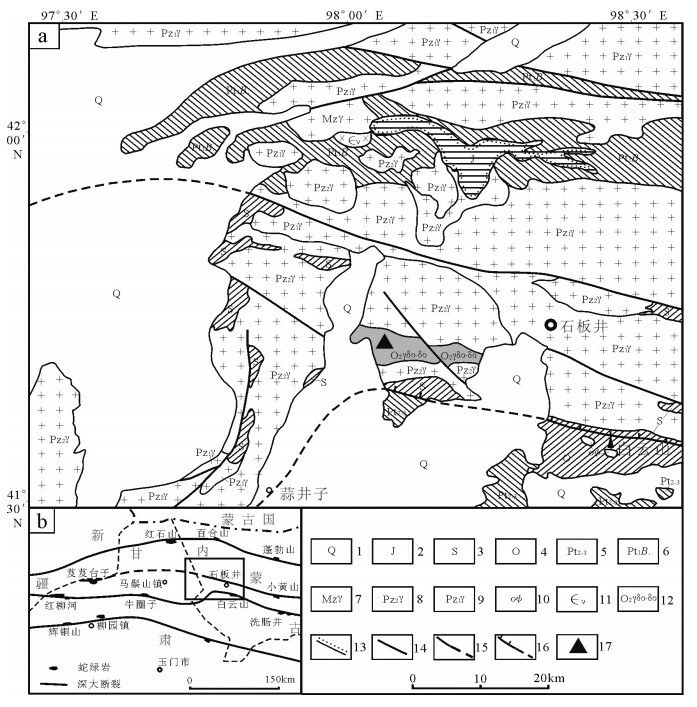 Resource Geology, 1998, 48: 225–236. DOI:10.1111/rge.1998.48.issue-4. Miller C F, Mc Dowell S M, Mopes R W. Hot and cold granites? lmplications of zircon saturation temperatures and preservation of inheritance[J]. Geology, 2003, 31: 529–532. DOI:10.1130/0091-7613(2003)031<0529:HACGIO>2.0.CO;2. Barbarin B. A review of the relationships between granitoid types their origins and their geodynamic environments[J]. Lithos, 1999, 46: 605–626. DOI:10.1016/S0024-4937(98)00085-1. Wyllie P J, Ryabchikov I D. Volatile components, magmas and crit-ical fluids in upwelling mantle[J]. Journal of Petrology, 2000, 41(7): 1195–1206. DOI:10.1093/petrology/41.7.1195. Condie K C. Geochemistry and tectonic setting of early proterozo-ic supercrustal rocks in the southwestern United States[J]. Journal of Geology, 1986, 94: 845–864. DOI:10.1086/629091. Pearce J A, Harris N B W, Tindle A G. Trace element discrimina-tion diagrams for the tectonic interpretation of granitic rocks[J]. Journal of Petrology, 1984, 25: 956–983. DOI:10.1093/petrology/25.4.956. 何世平, 周会武, 任秉琛, 等. 甘肃内蒙古北山地区古生代地壳演化[J]. 西北地质, 2005, 38(3): 6–15. ① 陈超, 刘增校, 潘志龙, 等. 1: 5万石板井等四幅区域地质矿产调查图. 2016. ② 潘志龙, 陈超, 刘增校, 等. 1: 5万基东等四幅区域地质矿产调查图. 2015.